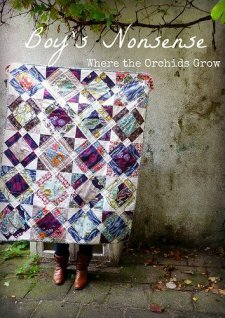 "Before we get started I would love to give credit where credit is due by linking you to the quilt that inspired my design, but for some reason the link is no longer working! It was inspired by a detail shot from a Tokyo Quilt Festival quilt - sorry, I don't know who made it. "Fabrics used are Field Study by Anna Maria Horner, Kona cotton solids and a few Art Gallery prints."